BG18 Series Bar graph Indicators can be mounted either vertically or horizontally and provide a dynamic analogue display of any type of process parameter that can be transmitted to the indicator via process voltage or current input. BG18 Series indicators have large, bright, 30-segment LED bargraph displays with a scale length of 75mm that are particularly well suited for applications where readings must be taken at a distance. Electrical connections are via plug-in screw terminal blocks. 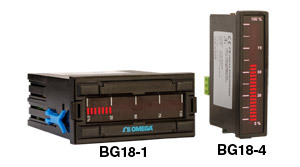 Nota: Standard power supply for BG18-4 and BG18-5 is 16 to 30 Vdc non-isolated.